Father Ted becoming Pope? What's not to like? 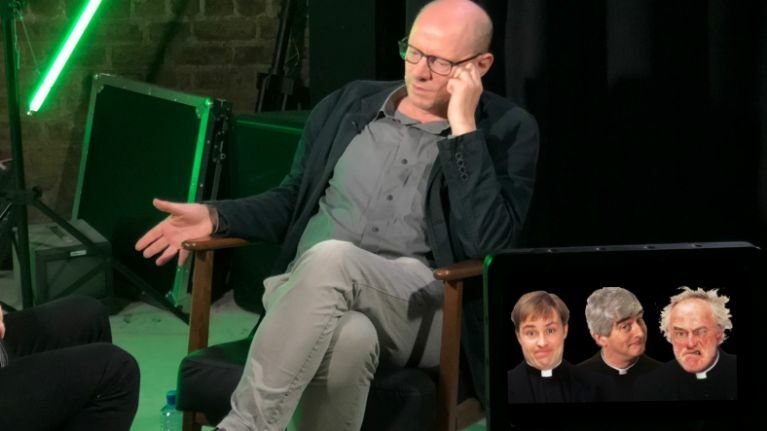 Writer, comedian and co-creator of Father Ted, Arthur Matthews was this week's guest on Ireland Unfiltered with Dion Fanning. The Meath native discussed plenty of things from the Irish love of a good, short mass, to how he's working on a new comedy about Brexit with a superb cast potentially lined up to star in it. But Matthews also gave a much-needed update on the progress of one of the most anticipated musicals in Ireland, Pope Ted. Dion: What can you tell us about Pope Ted? Arthur: Well, it’s written, first draft. The music in it is fantastic I can tell you that. Neil Hannon and Paul Woodful. It’s brilliant, it’s like really good. So but because it doesn’t exist. The music exists so I can say what that’s like but because the show doesn’t exist yet, I don’t know. I mean I presume it’ll be good. Arthur: Yeah it’s written, the first draft, but it will change. Dion: But it’s about Ted becoming Pope? Arthur: Yeah... the clue is in the title! Dion: No I was wondering, that hasn’t changed? Like that hasn’t..? Arthur: No that’s still what it’s about. yeah. Graham doesn’t like really revealing too much about it. He’s very secretive about it. You can listen to the sixth episode of Ireland Unfiltered in its entirety by simply clicking here, and you can use #IrelandUnfiltered to join the conversation on social. Ireland Unfiltered, brought to you in partnership with Carlsberg Unfiltered, is available everywhere you get your podcasts and on YouTube every Tuesday.